Are you wondering when to use the future perfect tense? Don't worry, by the end of this short explanation, "you will have learned" all you need to know! We use the future perfect simple to describe an action that will happen at some point in the future before another action. If you son keeps working, he will have earned $100,000 by the time he graduates. She will have completed another certificate program before they hire her. The thieves will have spent all the money before we catch them. My assistant will have bought the plane tickets before making the hotel reservations. When you buy the house, how much will you have saved for the down payment? Will we have learned enough vocabulary to pass the exam in June? I will not have finished my novel before I meet again with my publisher. My son's a player. He will have dated at least 150 women before he gets married. We can use the future perfect to describe how long an action will occur before a future time. We may know what the exact time is but it's not important. By next year we will have lived here for 25 years. On June 1st, my parents will have been married for 50 years. I'm going to take my daughter to the hospital. By tomorrow, she will have had a severe headache for a week. By the end of exams I won't have slept for three entire days. If my boyfriend and I are still together at the end of the summer, we will not have seen each other for six months. An important anniversary is coming up for me. In a month I won't have had an alcoholic drink in a whole year. He will have saved a lot of money by retirement. We can use the future perfect to describe an event that we are sure has happened very recently. I'm sure my assistant will have finished the report by now. Don't bother going. The train will have already departed by now. It's 2:00 PM already? The café will have finished serving the daily special by now. I have to run. My guests will have arrived at my house by now. The stores will have closed by now. We should have left earlier. The move will have sold out by now. 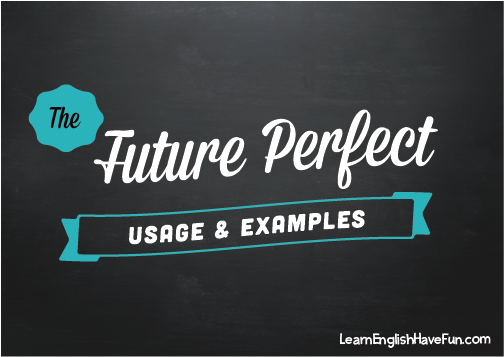 If you need to review how to form the future perfect tense please check this page. I go over the positive and negative forms, questions, review the irregular past participles and spelling changes and give lots of examples.